Wife of Frank Henry Leder, married March 24, 1927. Alice’s mother married a second time and her name became Mary E. Hinze. Mr. and Mrs. Frank Leder celebrated their 25th wedding anniversary, Monday, by spending the day in Roseland and attending a theatre. 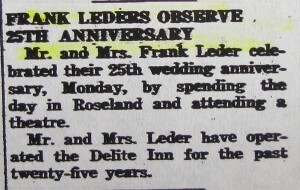 Mr. and Mrs. Leder have operated the Delite Inn for the past twenty-five years. 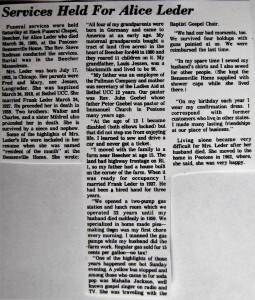 Funeral services were held Saturday at Hack Funeral Chapel, Beecher, for Alice Leder who died March 26, 1980, at the Peotone Bensenville Home. The Rev. Steve Redman conducted the services. 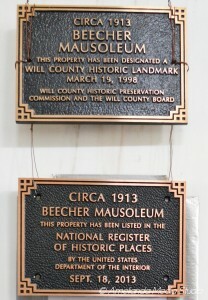 Burial was in the Beecher Mausoleum. 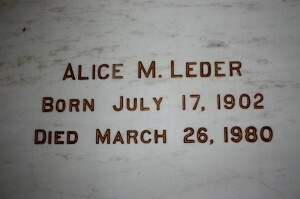 Mrs. Leder was born July 17, 1902, in Chicago. Her parents were Fred and Mary, nee Jessen, Langreder. She was baptized March 24, 1918, at Bethel UCC. She married Frank Leder March 24, 1927. He preceded her in death in 1959. Two brothers; Walter and Charles, and a sister Mildred also preceded her in death. She is survived by a niece and nephew. “All four of my grandparents were born in Germany and came to America at an early age. My maternal grandmother bought a tract of land (five acres) in the heart of Beecher for $40 in 1860 and they reared 11 children on it. My grandfather, Louis Jessen, was a blacksmith and lived to be 96. “My father was an employee of the Pullman Company and mother was secretary of the Ladies Aid at Bethel UCC 12 years. Our pastor was Rev. John Goebel whose father Peter Goebel was pastor of Immanuel Church in Peotone many years ago. At the age of 12 I became disabled (both elbows locked) but that did not stop me from enjoying life. 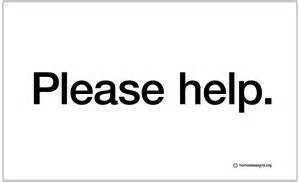 I learned to sew and drive a car and never got a ticket. I moved with the family to a farm near Beecher at the age 15. The land had highway frontage on Rt. 1, so my father had a house built on the corner of the farm. When it was ready for occupancy I married Frank Leder in 1927. He had been a hired hand for three years. 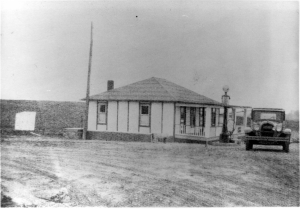 We opened a two-pump gas station and lunch room which we operated 32 years until my husband died suddenly in 1959. We specialized in home made pies — making them was my first chore every morning. I manned the gas pumps while my husband did the farm work. Regular gas sold for 15 cents per gallon – no tax! One of the highlights of those years happened one hot Sunday evening. A yellow bus stopped and among those who came in for a soda pop was Mahalia Jackson, well known gospel singer on radio and TV. She was traveling with the Baptist Gospel Choir. We had our bad moments, too. We survived four holdups with guns pointed at us. We were reimbursed the last time. 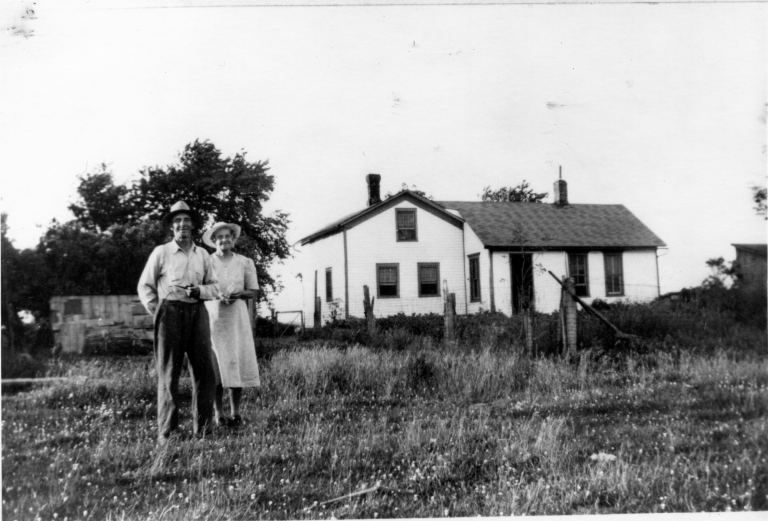 Living alone became very difficult for Mrs. Leder after her husband died. She moved to the home in Peotone in 1962, where, she said, she was very happy. This entry was posted in Automated Burial Listing, Bethel USS, Burial Listing, Burial Location, HEADSTONE, Obituaries- Have Full Copy by Sandra. Bookmark the permalink. 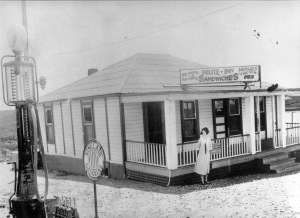 A photo of Alice Leder in front of the Delite Inn can be found in the book The Dixie Highway in Illinois (Images of America series) by James R. Wright.